Danielle Heenehan received an SSI Travel Grant for $160.90 to attend the Portland Mushroom Cultivation Weekend in November of 2013. Danielle wrote a short summary and brought back a few pictures for the Ecologue. Fungi are some of the most important and ecologically diverse groups of organisms on the planet. They play an important role in nutrient cycling in forests by breaking down organic matter; they inhabit the roots of most vascular plants providing them with essential nutrients which in turn provides us with good healthy food crops; they provide numerous drugs for mankind such as penicillin; and also provide many different foods for us to eat. After taking Mycology and Permaculture Design at OSU as well as jumping on the “mushrooms can save the world” bandwagon, I was very excited for the opportunity to attend a 2-day Intensive Mushroom Cultivation/Mycopermaculture Course in Portland, Oregon thanks to a travel grant I received from the Student Sustainability Initiative! aspects of conservation; and using fungi to clean up polluted soil or water (mycoremediation). In order to reap the many benefits fungi have to share with us, we must know how to cultivate them and this was the main focus of the course. 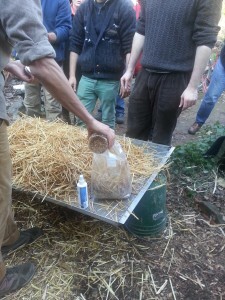 We learned a variety of sustainable mushroom cultivation methods. This included growing mushrooms on easily accessible or recycled materials (cardboard, wood block, or raw sawdust) as well as materials to fruit mushrooms on (logs, compost, straw, and food waste). Overall, the course was a lot of fun and I am excited to apply some of what I learned towards working on local permaculture and/or sustainability projects.